There are tons of questions out there regarding the results of removing a friend on Snapchat so in this article, I thought I’d give answers to the most common questions about deleting someone on Snapchat. NOTE: Unfriending someone is the same as deleting and removing someone. Blocking someone on Snapchat means something else. What happens when you delete someone? “Remove friend” removes a person from your friend list. Doing this will make them disappear from your friend list, and if your privacy settings are set so that only friends can Snapchat you, then, you disappear from their friends list too. When you remove someone as a friend on Snapchat, it is sort of like blocking them except they can still message you and snap you (if your settings allow it). Just that it will say “pending” until you decide to add that person back and receive their snaps. Will I lose the streak if I remove someone? If you delete someone, your streak will still be there if you add them back again. however, after 24 hours, the streak will disappear if you don’t message each other. Can they still view my story if I delete them? That depends on your settings. 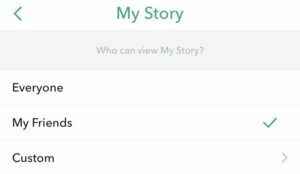 If you have set your settings to “open”, then anyone can see your story whether you are friends with them or not. If you simply delete one of your friends, then they will still be able to see your content, you just don’t see theirs. People that aren’t your friends on Snapchat can see your Story if you have your settings open. Now, only your friends can view your Snapchat Stories.